This blog post is a Product review of Printcopia, a Photo-to-canvas print service, based on the free product that I received from Printcopia, however, the views in this post are 100% mine. A few weeks ago, Printcopia reached out to me to send me a sample for review and perhaps even a Give-away. While this blog is mainly about eating (mostly vegetarian) food in restaurants,, it will, occasionally, feature something other than eating out. I was looking to use a service for photo-to-canvas printing, when Printcopia reached out to me and I thought, why not? Printcopia was very easy to use. I was given a code to use for an 8″ x 10″ color canvas print (value $60). The toughest step in using Printcopia was figuring out which photo to choose for printing. Most people seem to choose close-ups for printing on canvas (why is that the case? 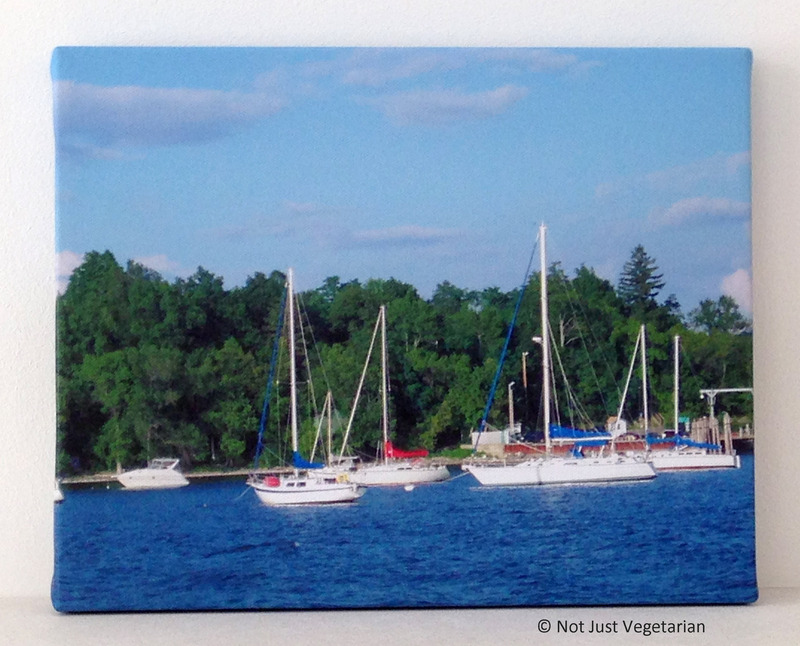 ), while I chose a photo of Lake Champlain from a road trip to Montreal a few summers ago. This photo always make me smile – brings to mind fond memories of the vacation and a gorgeous summer day on the lake! The only step that involved further decision-making was when I had to choose delivery options – free delivery (5-7 days) or express delivery (2 days, I think). I considered express delivery, but balked at the $60 that I had to pay for express delivery and settled for the free delivery, which took almost 2 weeks to arrive (more like 10 business days). This is what the finished product looked like. I am particularly happy with the sharpness of the image and colors on canvas – one can even see the different shades of white / grey in the clouds. There are many Photo-to-canvas print services one can choose from, I have used none other than Printcopia and therefore, cannot compare and contrast different services. I am very pleased with the ease of use of Printcopia and the quality of the finished product. The Printcopia website has many FAQs that are very useful and helpful to photo-to-canvas ordering novices like me. My only gripe about Printcopia is their exorbitant charge for express delivery of the finished product, but then, if you have time, it’s not an issue. Have you used any other photo-to-canvas print services? How would you rate your experience?